Between noble and milton. Take G to greenpoint stop, but also within 15 mins walking distance from the bedford L.
The Meta Agency is creating a world where visual, experiential and interactive artists are stars of the show. We pair highly specialized creators with brand and business platforms to develop and build next level immersive experiences. Our artists specialize in Projection + LED Design, Interactive Installations, Visual Design, Art Direction, and Video and Audio Production. We represent Talent Beyond. 917 734 0587 call for directions or when you are inside, but you can also come right up to the fifth floor. ￼Gabriella Levine is a creative technologist, interactive artist and open-source hardware designer interested in the relationship between technology and ecology. She holds a Masters degree in Design and Technology from ITP, Tisch School of the Arts, NYU. She creates sculptural and robotic works that mimic environmental phenomena and animal behavior. She is passionate about biomimetic robots, PCB’s, electromechanical actuation, wireless sensor networks, and coding. She is the COO of Protei Inc, manufacturing robotic biomimetic sailboats. 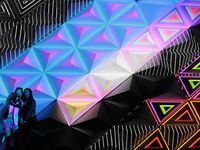 Since 2010, Levine has exhibited work internationally including Ars Electronica, MIT Media Lab, Meta.Morf Electronic Arts Biennial (Norway), and the American Museum of Natural History. She received the 2012 Prix Ars Electronica Hybrid Arts Award, the first Artist in Residence at Instructables, the NYU Task Force Green Grant, the Gulfstream Navigator Savannah Ocean Exchange Grant, and was named Woman of the Hour top 24 women in Tech in 2011 by Limor Fried, Adafruit Industries. Levine just returned from a radical experiment, circumnavigating the world by boat, as a Fellow of the Unreasonable At Sea accelerator, exposing Protei to 14 different ports worldwide, while innovating through human-engagement using a design-based approach of the Stanford d. School. 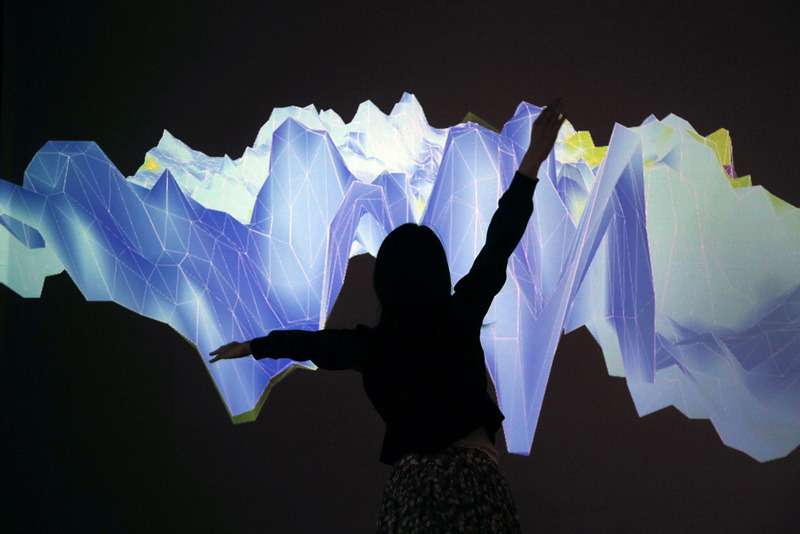 The IMC Lab + Gallery is pleased to present “Climate Art: New Ways of Seeing Data”, a data visualization show, in collaboration with the Robert Rauschenberg Foundation, Ballroom Marfa & NRDC, curated by Isabel Draves, founder of LISA (Leaders in Software and Art). This exhibit will be on view October 12 through November 27 as part of Marfa Dialogues/NY, a citywide examination of climate change science, environmental activism and artistic practice taking place throughout New York this October and November.Marfa Dialogues/NY will feature more than 20 Program Partners, including The IMC Lab + Gallery, NRDC, and a spectrum of exhibitions, performance, and interdisciplinary discussions at the intersection of the arts and climate change. With Nadav Hochman and Jay Chow. The collaborators downloaded and analyzed 2,353,017 Instagram photos shared by 312,694 people in thirteen cities over a three-month period. The large prints and video included in the exhibition combine these photos to reveal unique patterns. One set of images compares New York, Tokyo, and Bangkok using 150,00 Instagram photos. Another image, created by 53,498 photos taken in Tokyo over several days, depicts a gradual progression from day to night activities. A visualization of 23,581 photos shared in Brooklyn during Hurricane Sandy captures the dramatic narrative of that day.